What an incredible country and an amazing trip. Have you ever been? what do your pinterest boards say about you? wow, these pictures are amazing – the original instagram, but better….I can’t believe you were on the edge of that cliff??? I haven’t seen that picture before…it made me dizzy and afraid, but it is an incredible image!!! Yes, I’ve been and this so brings back memories! Thanks for posting! A great piece!!! Truly my favorite place to go, I have incredible memories of my childhood there!!! Thank you for sharing! 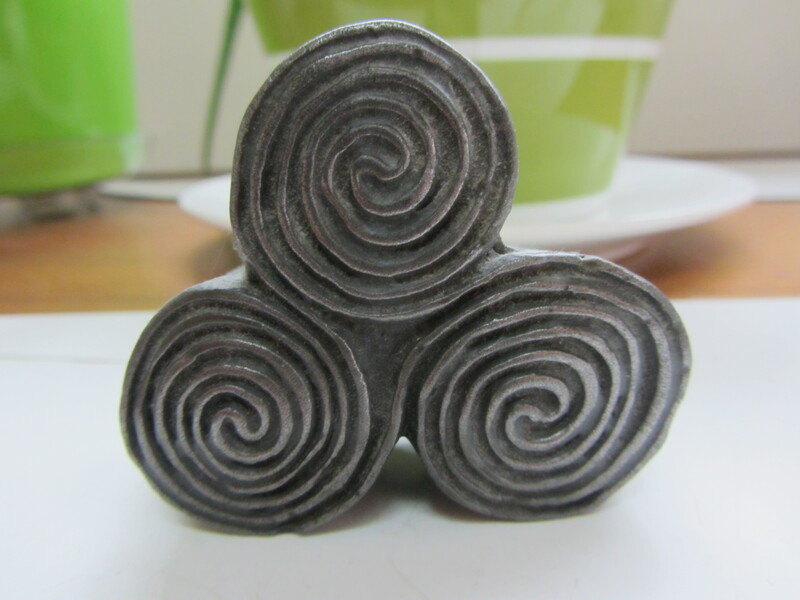 I’ve seen the triple-spiral symbol before. Thanks for the info on what it actually is! Great photos. how lovely – thank you for the visual tour. thanks – you have nice photos on your blog, too! thank you for introducing me to the term “shed antler hunting” cool! Great post! I miss Ireland already! Congrats on Freshly Pressed. Beautiful pics, as an irish person living far from home, they made me homesick – especially the last one. Thanks – yours is a gorgeous country 🙂 Thanks for the Salmon recipe including Guinness. Nice. Glad I did the place justice. Thanks so much for reading! We visited Ireland for 8 days, not nearly enough time….I envy your being there for 3 months! It looks like you had lots of fun!! We loved Galway and the area west of there, Connemara, so beautiful..all of it!! It is certainly the longest “trip” I have ever taken and was fun to try to insert ourselves in the community and meet some people 🙂 Thanks so much for reading 🙂 Nice shots of Ireland on your site as well! Oh, I LOVE this post! I was in Ireland last year and traveled the island as well. I fell in love with the landscape, the culture, and the people. I’ve traveled to some beautiful places, but none of them hold a candle to Ireland (in fact, I loved it so much that I’m going back again this summer!). Also, the road signs are ridiculous. I was the navigator as we drove around the island, but I figured it all out…after about 4 or 5 days. Haha! I lived in Ireland for a year but I did not have the opportunity to do a lot of exploring. I do agree with you – it does not rain as much as everyone would would like to think, but it did rain an awful lot! Yes, we did bust out the rain jackets and umbrellas quite a bit! Thanks for visiting the home tome! Great intro. I’ve been many a time but I didn’t know anyone played cricket there. The things one learns in WordPress! Galway City is my favourite. Glad we chose Galway – can’t remember how much research we did on that or if we just threw a dart at the map, but it worked out very well. I have and it was fabulous! Thanks for sharing! I can’t wait for my trip to Ireland in July. Have fun! Hope your camera doesn’t die on that trip because you are going to want to snap pix pretty obsessively. Certainly have! I shared a tour of the Dingle Peninsula and Ring of Kerry with two lovely ladies in a campervan a few years back. The rain was as soft as they say it is and I managed to stay friends with Beryl (just! ), who was doing the driving while I shared navigating/tea making duty with Sunny. They left me to my own devices for a few hours in Dublin while they returned the van. Happy days! Would love to see Galway and the north west. Thanks for the memories. Happy St P’s! Highly recommend Galway – obviously more of a small-town vibe than Dublin but has its own great energy. BTW, nice pix of Portugal, wow! Charming post and photos. Thanks for sharing. Thank you for reading – your books set in Aruba are intriguing…. OMG those signs! they just look like they’d take years to understand. I bet they repeat the same thing a whole ton too lol. Thanks for checking out my site – enjoy your corned beef and cabbage! Thank you for visiting the home tome – the photos on your blog are wonderful – fun to see snow on the ground in Cork! What great photographs! Congrats on freshly pressed! I’ve never been, but I would love to go not only because there’s Irish in my ancestry, but because of the Nora Roberts novels I’ve read that were set in Ireland. Sorry about the Guiness. I tried it once. It made me gag. It looks like molasses and has the warmth and mouth feel of phlegm. I guess it’s an acquired taste. I do think Guinness is an acquired taste for many: I acquired it that summer and have lost it since! But I can see why people love it – it is very distinct. I, too, have fond thoughts of Ireland, and Nyack where I studied theology. Saint Patrick was truly a gifted man. May you enjoy his day! When I was dating my wife in 2009, I visited her hometown Armagh, in Co. Armagh in Northern Ireland where St. Patrick has both of his Cathedrals. (One Protestant, and one Catholic). It was beautiful, and yes I did find it to be quite sunny. Good read. I regret that we did not make it to Northern Ireland – I know there are some wonderful things to see there. Thanks for reading. Happy St. Patrick’s Day to you too! Great post, I don’t know how you got such good weather when you went, every time I go to Ireland it rains all week! We were shocked – it was a funny and surprising start to our trip – we wondered if we should have packed all that rain gear – and then, well, we were quite glad that we did. Lucky to say I lived in Derry, Northern Ireland for half a year. Time was spent as semester abroad but I learned way more outside the class room. Ahhh, those days were brilliant and I miss the green rolling hills dotted with sheep. If I wouldn’t have to earn money I would move there, buy a tiny farm and just live my life away. Lucky that you were able to study there – I certainly would have enjoyed that – but it was fun to roam around, too. Thanks so much for reading. Thank you – huge compliment coming from you. The photos on your site are very inspiring – wonderful details! 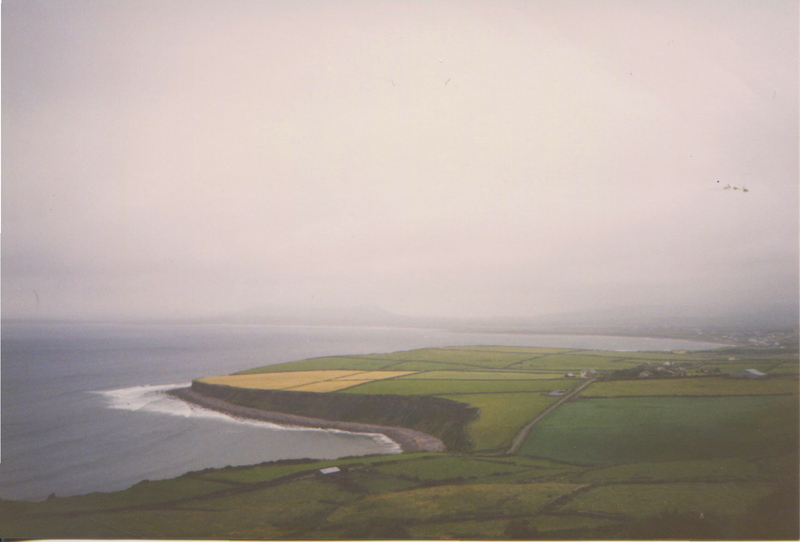 These photos make me want to go to Ireland so much more than I already do! These are gorgeous pictures. The one of the cliff made me feel uneasy just looking at the cliff to the ocean. I’ve been to Dublin once when I was in high school and would love to go back. Ireland is truly beautiful. First of all: Brilliant post. Those street signs made me laugh out loud! Second: Your reading list and my reading list are identical. I think we share a sense of humor! Thank you! Yes, I find that there are too many “dark” books out there – many are well-written and beautifully rendered but mostly, these days, I just want to laugh, so sue me…:) Thanks for checking out The Home Tome! I love the nostalgic feel and color of the photos! In our digital age, I rarely see these anymore! Thanks for sharing. Born and raised there now living in the US… thanks for the trip back home. Congrats on being Freshly Pressed and Happy St. Paddy’s Day! Thank you! You are lucky to have your roots there! Great post… I live in Australia where cricket is quite big & I still don’t completely understand it! You are lucky! BTW, never grew a chili before but those plants are so attractive. I applaud your no-nonsense approach. Such a great post and a lovely trip down memory lane. 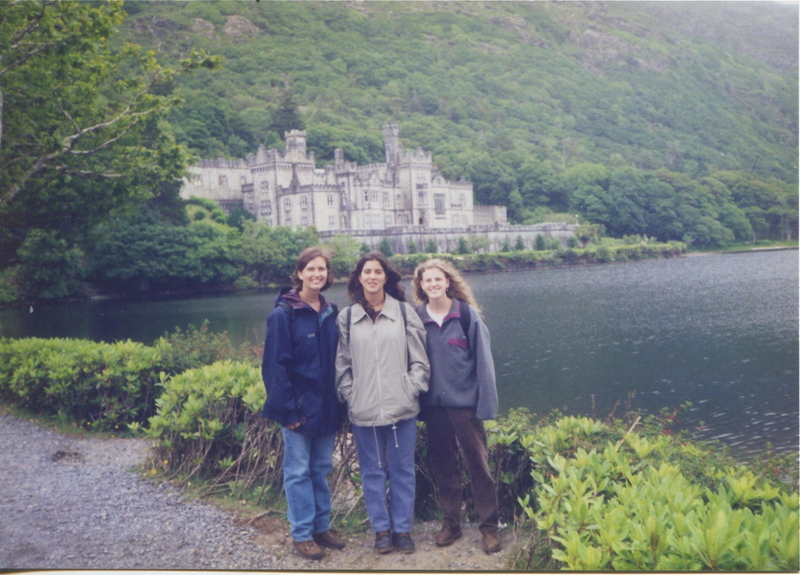 (I think I have that same Kylemore Abbey pic – well, without you & your friends, but with my Mom and Dad!) Thanks & Happy St Patrick’s Day! Sure, these pix are great but if I also had a leprechaun terrarium I really be all set for some good craic! Thanks for reading! Lovely! My mother is from Galway and 12 years ago, she, my sister & myself to the SAME trip, going to the SAME places you visited. Nice reminders. We stayed in a B&B right outside the city centre in Galway. LOVE the daily Irish breakfasts!!! Fried tomato ~ yum! Thanks for sharing. Thanks – I couldn’t have done any of this without my laptop! Beautiful. Cant wait til i get to visit ireland for myself. THANK YOU – that means a lot. I have not traveled extensively, but I was there when I was 23 and it left a huge and lasting impression. BTW, I am on the same page with you on high heels! thanks – love the street art on your site. My first thought when I saw this was “How did she get my photo from Muckross?” I have many of the same photos from my trip in 2005. Why didn’t I think of putting them up for St. Patrick’s day? Congratulations on your second FP! Thanks so much – didn’t know it could happen a second time, but it is truly a blast. Love the shots on your site. Great pictures. I love that country. That fourth picture looking over the cliff gave me vertigo. Good job! Thanks! These photos were peeled out of my scrapbook this AM then scanned @ my local pharmacy. Ha! Nothing like the professional shots on your site! 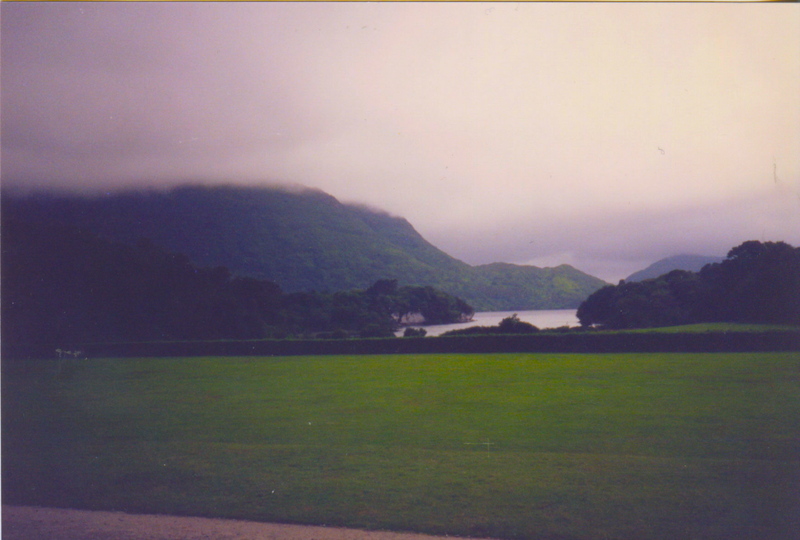 I loved going to Ireland when I was little. We only live in Wales, so we used to go quite often. Every visit Mum would take me to Dublin and I’d get my hair braided in the street and then we’d go see Molly Malone. Great memories! Thanks for reading! Thanks for this! It’s always interesting to see my home country from another’s point of view, makes me appreciate it more! I especially love the picture of the pitch in Trinity with the School of Medicine in the background and the Pav (our student bar) off to the left! Lá Fheile Phádraig Shona Duit and hope ye have great craic with friends and family! Thank you so much – feeling very glad that I have honored the place appropriately! In honor of St. Patty’s Day & all the rainbows leading to pots of gold! Happy St Patrick’s Day!! lovely post.. the souvenir you got is pretty interesting.. i love how it interweaves with one another.. really like it. congrats on being FP. Yes, I have a thing for circles and dots…I have seen this design as a ring, before too. Thanks so much for stopping by! Like your title. Very rhyme. Good photos too ! okay, first off…. the pictures are amazing! The one of the cliff scared the crap out of me though. Can’t believe you were that close! Second, love the blog. Very interesting to read. I have roots in Ireland but have never been. Coming from Newfoundland, Canada, we really know how to celebrate St. Paddy’s day here but there’s nothing like being in Ireland. Hoping to go someday. Third, thanks for the pictures. They are fab! It is a special place. Thanks for checking out the post. I love your post and your pictures. I have been to Ireland ten times and am trying to figure out a way to move there. The first time i was there, my friend, Amy and I decided we need to own a pub, until we found out how much they cost! Happy St. Patrick’s Day to you!! oh, wow 10 times! this trip I took was 17 years ago, and I haven’t made it back, since! the coast is really beautiful, i imagine one day i’ll visit ireland too, thanks for sharing photos. Thanks so much – the response to this little piece has been very kind and supportive. I really enjoyed your post and your photo’s are amazing… I travel to Ireland a few times a year and when I saw the images it just reminded me of my travels throughout the country. Thanks for the post and refreshing my memories of my travels to such a beautiful country. Happy St. Patrick’s day…. Thanks for the compliment on the photos – I was not, and am not a professional photographer – so I wasn’t sure how they would come out on screen. Highly recommend! Thanks for stopping by. Done research about Irish economy(in tough situation now,but i hope they will make it).The reason why i have chosen Ireland, is its history and beauty of borders.Great Photos and very interesting story! Yes, it was very much like that – the countryside covered with mist and all the little cottages with smoke coming out of the chimneys…thanks for reading! fantastic pics, esp. 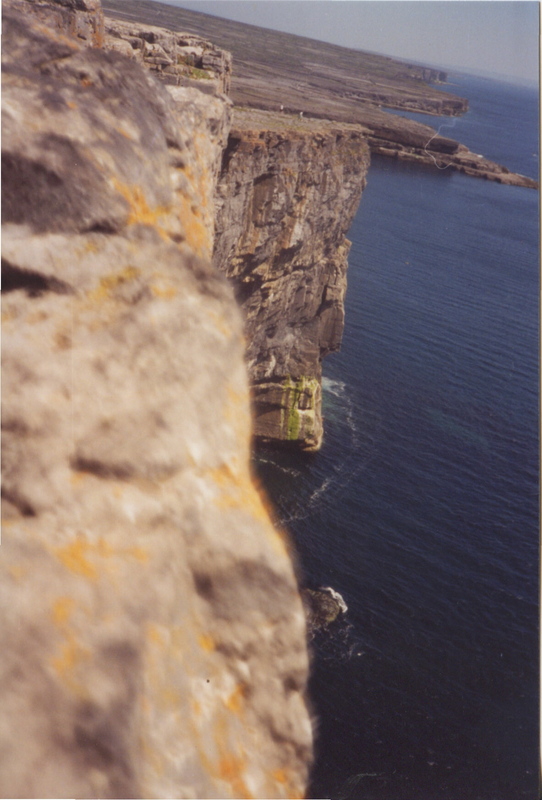 aran island edge of cliffs and the coast of ireland. And yeah…i miss the dolphin pic. Enticing Landscape! Never been to Ireland, but this makes feel that I must. 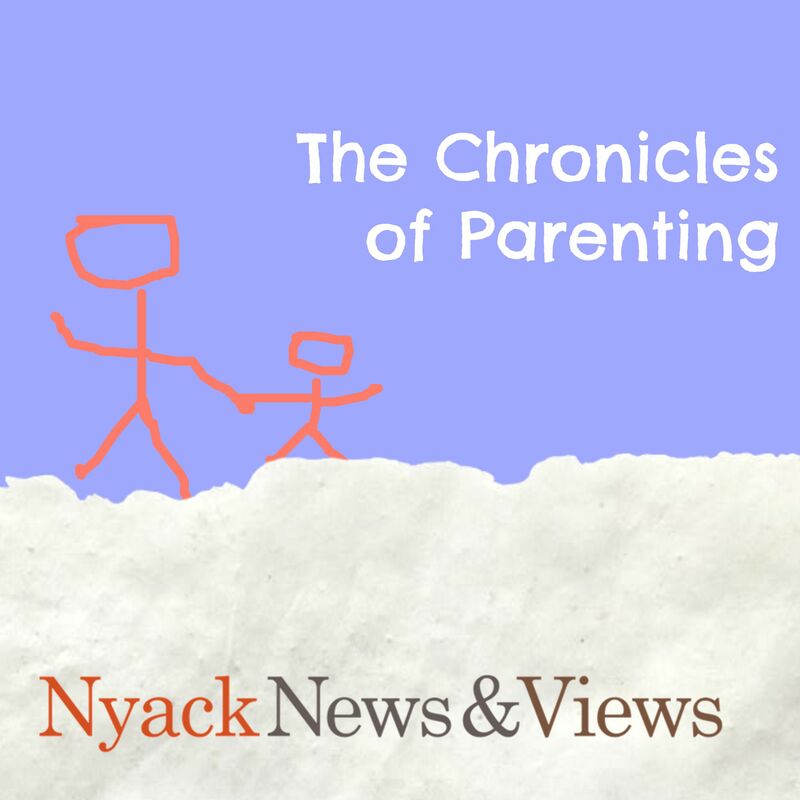 I rarely say this, but I really enjoyed this blog. I live so close to Ireland, but I’ve never been. However, some of the things you have mentioned here just made me wanna jump on the next plane over there! Lovely post. Happy St. Patrick’s Day from Dublin, Ireland. Thanks for helping the world think of us over here. It’s nice to be in the green spotlight on one day a year, at least. Thank you – you have some beautiful pictures of Ireland on your site! Great pictures! All of mine were from a disposable camera too! Hope to go back in June to take more but this time with a digital! There’s no place like it in the world!!! Lá Féile Pádraig Shona Duit! Glad to bring a smile – definitely one of my main goals in life! Thanks for the weather update over there! What a lovely post, and what glorious memories it has given you – for life. My father was from Dublin, and I’ve been back there and done a little exploring (I still have relatives in Ireland). There are so many beautiful spots in Counties WIcklow, Cork and all over the West that I could bore on about them for ever (I’ll spare you!). Dublin’s a great city, one of my favourites; built on a human scale and buzzing with life – there’s always something interesting happening, especially in the arts. Your cricket players on the green at TCD reminded me of watching just such matches in the summer of 2005: happy days! Thank you, and all the best for Saint Paddy’s. Thank you so much for sharing – we also had a fun time in Dublin! It seemed an intimidating place to me at that age – big and quite bustling – this was long before I lived New York City…would love to go back again! Happy St. Patrick’s Day! It’s great to see such a fun but reflective piece on Ireland. I am Irish and living in the sunny south-east in Co. Waterford. I hope you enjoy this slideshow which I made in honour of the Big Day. Wonderful slideshow – thank you for sharing – love the fisherman and also the one with the moss. Loved reading through your blog post! How timely, because I actually just returned from Ireland! I posted in four parts, but they can be accessed via the link below in case your curious. We had some similar observations. For example, my friends and I also noticed the brilliance (read: maddening) signage, and I’m pretty sure that the weight I gained on the trip was in direct proportion to the amount of Guinness I drank ;). Cheers and happy St. Patricks Day! Happy St. Patrick’s Day. Ireland is great, it has a heart and soul, and great, friendly people. I’ll drink a Guinness to your continuing good health! Looks beautiful there. Always wanted to go to Ireland, maybe one. I ♥ your photos, they have such a lovely feel about them. It’s been twelve years since I’ve been there! Many happy memories, and somewhere, I have my photos (pre-digital) buried from that trip. I need to find them. Your pictures are beautiful, and made me long to go back again. Thanks for posting! Very fantastic pis and really giving relax to our eyes and mind also..congrats for being freshly pressed. Nice!Great pictures! Ireland may be my next trip this year hopefully. Thank you for these great images of Ireland. I want to go there someday myself. Your images and words have strengthened my desire to get there. Thanks again so much! I’ve been there to visit a teacher friend from county Cork. I want to return to spend a month or two there, seeing all the counties and meeting wonderful people. LOved reading your piece and seeing your photos! Happy St. Patrick’s Day! You make Ireland look like tropical paradise! Good post. Love the images. You have captured a slice of Ireland there; apart from cricket, which is something the colonials imported! Bravo for Pressley Freshed!! Yes, been on the River Barrow canal boating with ridiculous friends who love the ridiculous rain…which was good since it rained the entire time!! Brilliant hire car adventure, too…especially Doolin. Going back to find the freckle family I inherited them from. I live in Ireland, great representation of the country. I’m glad you liked your stay. Beautiful pictures. Ireland is one the most fascinating countries my wife and I have visited. The people of Ireland are absolutely lovely and certainly welcome Americans. We look forward to our next visit. You must visit Trinity College when you go! A real treat. I am convinced that once you visit Ireland, you can never come all the way home again. These pictures are fantastic. You certainly took great care of scanning them in and preserving the vintage quality of them. How many times have you gone back since? I’ve been to Ireland only once and the countryside still looks the same from your pictures. I’ve only been once, had a fabulous time too (hospitality and FUN factor second to none!) and can’t wait to return……Thank you for bringing back such happy memories and Many Congrats on being Freshly Pressed! Happy St. Patrick’s day! Oh, sweet memory! Lovely images … it all makes me want to go back. 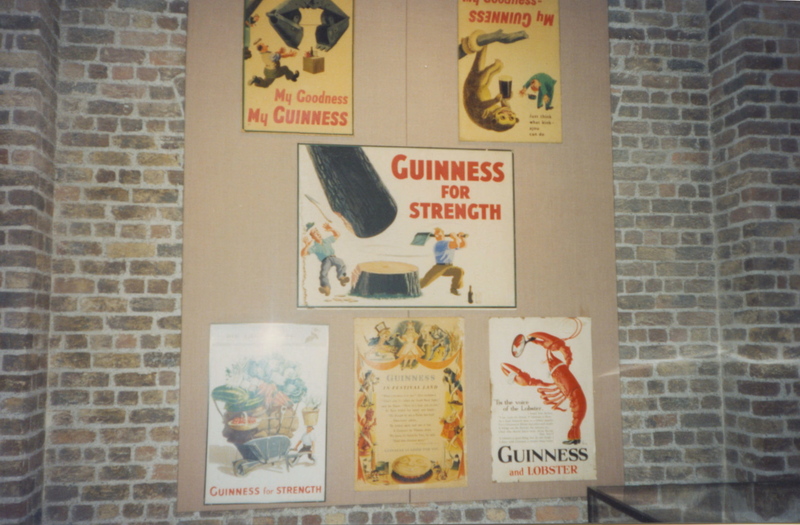 A rich land, a rich folk – ah and the Guinness! I do remember standing at the edge of the unfenced, unfettered Cliffs of Moher in gale winds, laughing at the reality and knowing that it would NEVER be possible to do the same back at home! Thank you! in the pubs but we also chose Harp Lager. The bus trips were fun and interesting. Cheers to all celebrating St. Patrick’s Day ! I love it! Great pictures! I was there a year and a half ago and it looks the same (beautiful)! Absolutely loved this blog because I was there last year!! Hired a car and went round the whole country. What a truly magnificent place. It was the best place I’ve been to – and I’ve been all over the world. The friendliest people, the best looking guys…., the most incredible scenery, and cutest sheep and yes I too stood on the edge many many times! Did come arrive 4kg heavier due to the Guinness, but hey, it’s good for you! Yes, the sheep are so cute! These are so beautiful! I’m insanely jealous that you spent 3 months living in Ireland. I’m planning my first European visit for next year, shooting for a 10-day England & Ireland trip and your pictures have made me even more anxious for it! beautiful! It’s always been my dream to visit Ireland…your pictures has just thrown gasoline on that fire! Did St. Paddy preach that going around with two girlfriends is cool? Ahh awesome pictures. I lived for a couple of years in Dublin but only recently did Galway by motorbike. Great to see what it looked like – when were these taken? 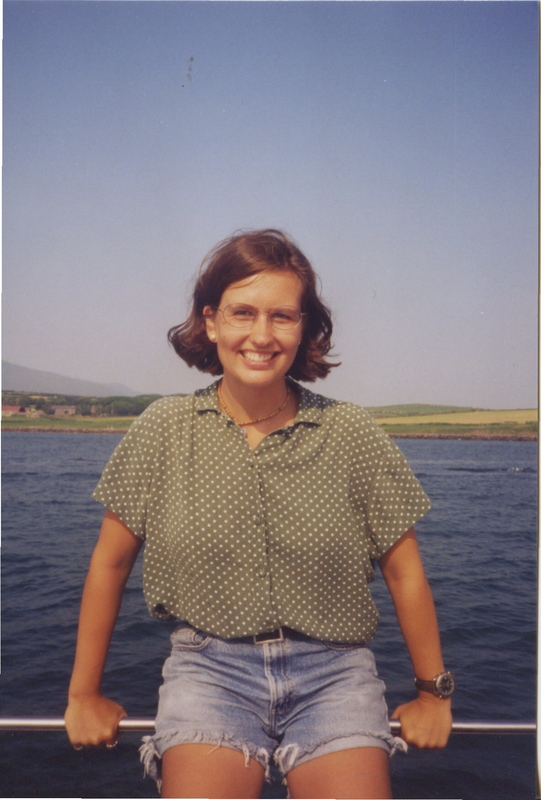 The summer of 1995 🙂 thanks for reading – loved Dublin as well. What I learned in Ireland: do NOT assume the debts of big banks. I have not been but with the surnames of Lynch, Doherty and Shepherd I’d say it’s high time…all I need now is a magical flying horse or unicorn…I wouldn’t care how I got there as long as I woke up with a Guinness and a Jamesons’ one in each hand…without having spilled a drop…of course! Thanks for this post….you have inflamed my wanderlust…I think that’s a good thing! Happy Saint Patrick’s Day from South Boston, Massachusetts! These pictures are amazing, I really loved reading this on St. Patty’s. I love the way they use there natural resources for the buildings and structures from rocks and stone. Great post and photos, it looks like a nice place to visit someday. I have been nagging my parents to take me to Ireland since I was ten or eleven, and I’m now sixteen and we’re not going this year. Maybe next year, though. I live in hope. Thanks so much for re-posting. The pictures are indeed great and last time I was in Ireland (yes, I was born there) I could still hang off the edge of the Cliffs of Moher, well, put my head over the edge and look down. I also agree Guinness fills you up. It is not a drink it is a MEAL! I took the hike up Croagh Patrick barefoot to follow the tradition and ended up helping a girl I met on route all the way down after she twisted her ankle. Rain in Ireland is the sweetest thing! Lovely post. Great photos. Compliments! Thanks for sharing. Greetings from Italy. Haven’t been to Montauk yet – but I am not far from there and intend to go – I will not be going anywhere near the edge – that was the stupidity of a kid! Thanks for stopping by! Great photos. What a lovely trip! Thanks for sharing! I love, love, love this post!! One of the places on my bucket list is Ireland, and I’m preparing to take that trip in about a year. Looking at these photos gets me excited for the trip to come!! Thank you for sharing!! I have never been, but I want to go. There are only four places I want to visit outside my U. S. homeland. I want very much to visit England, Ireland, Scotland, and Israel. Doesn’t look to hopeful for any of them at this point, but I can dream. Love your photos — especially the cliffs! Happy St. Patrick’s Day! So many of those sites look familiar. I went to Ireland and Galway not long after college. I think I saw that castle and my brave friend walked the cliffs while I worried how I explained to her mother why I let her daughter fall off a cliff. Those cliffs are windy, too! I stayed away from the edge and actually clung to the ground. I want to go back this summer! I have been to Ireland. Unfortuately not as long as you spent traveling. I went in July of 2009 after I graduated college. I had a friend who spent her 3 month intership in Dublin/Malahide. Her twin sister and I went to visit her for a week. With the little time that was spent there, we did as much as possible. We figured, we could sleep when we got home. I have been dying to go back ever since. This is a very inspiring post! Wish I could also visit Ireland in the future. Thank you for sharing this post! I’ve been dreaming of Ireland ever since I read it yesterday, and I had to come back and thank you for the inspiration. did you get to the Giant’s Causeway? Another of those places I have always wanted to visit. Having been to Ireland three times (and yearning to go again! ), I identified with much of what you wrote! I can recall saying that if America had the Cliffs of Moher, they would have ugly fences all along the edges with glaring warning signs. I appreciated the Irish government leaving that alone and assuming people have good sense. 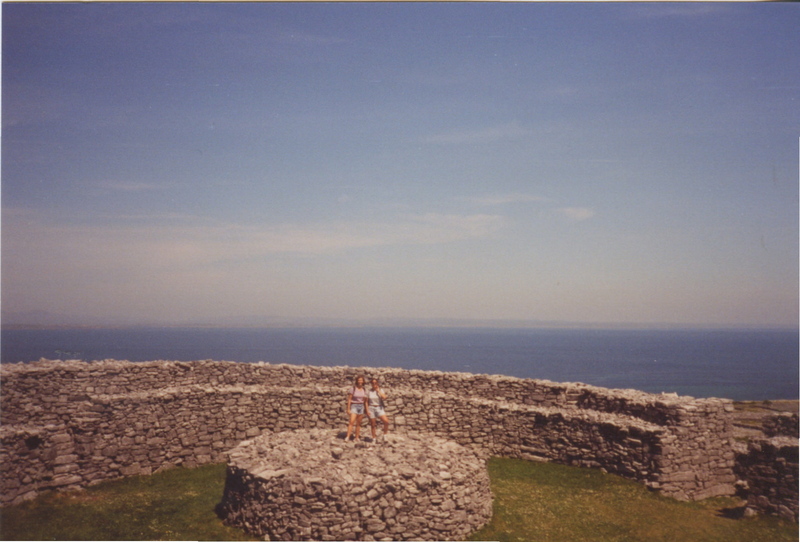 I also blogged about Ireland today–how the last time I was there I did what I called a “St. Patrick Pilgrimage” through which I visited the famous spots he is associated with. It was a very spiritual journey. 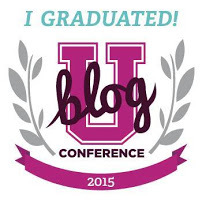 Loved your blog post! Love the pictures! 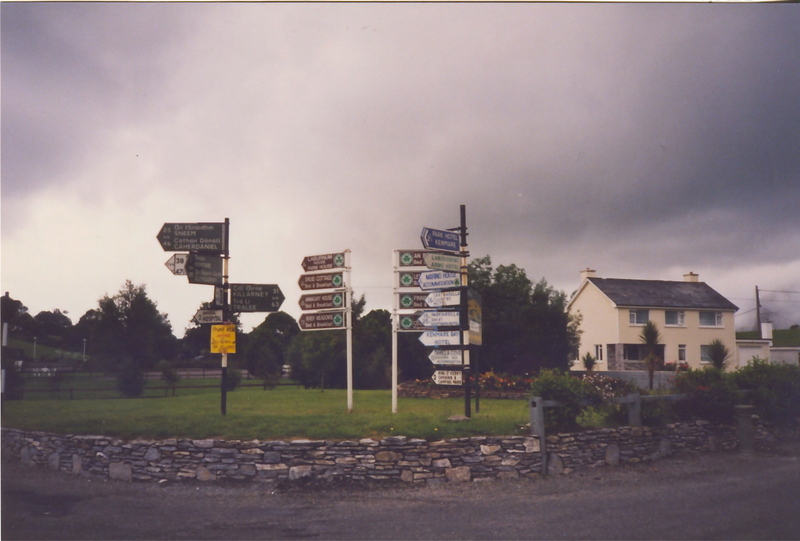 I thought the signage here was crazy-I’d start crying if I saw direction signs like the ones you noted in Ireland. I’m very Irish but never been to Ireland. Always wanted to though. Interesting pics of amazing scenes even though were taken with disposal camera! Happy St.Patrick day to you. Warm regard. Happy belated St Patrick’s day! And thank you for sharing your photos and memories, brought back memories of my visits to Ireland. Such an amazing country! Love it and I am sure I go back some day. Funny and good to see so many familar places! I love your photos. They are absolutely beautiful!! I have never been but would love to go. Your pictures are a butte and they show a lovely country waiting to be visited yet again. Nice way to pay homage on Patty’s Day. Those photos are not only beautiful, but touching. Thank you ! I went to Ireland four years ago. It was a journey of love and dreams. Your pictures, and your comments, remind me to that special place. Thanks! Nice to hear noce things aboutones country. Thanks. Thanks so much for the great article and lovely pictures of Ireland…my family and I have gone to Ireland twice, for 3 weeks each time, and after about 1 month of being home, I’m thinking about saving and planning for the next one. There is so much to love about Ireland, the scenery, the people, the music! Really great photos! I am going to Ireland with my Irish girlfriend in June and this has got me even more excited, so thank you! Great. Thanks for posting ! Phenomenal pictures 🙂 I hope I’m lucky enough to go to Ireland one day. I’m dying to go to Ireland. And I will once I have enough time ánd money! Wow, those are awesome photos. I really want to go to Ireland now. This was fun to read! It is in recollection that we strengthen our sense of who we are. I’d love to visit. I hear they have quite the booming film industry, so I might just go there for a while. If I had a ‘bucket list’, visiting New Grange would be on it. Thanks for sharing your photos, it’s refreshing to see a real view from a real person instead of a ‘travelog’ with ulterior motives. Your pictures are beautiful. I love to watch specials on television about Ireland. I studied abroad in England, and loved it. Your pictures of the coast are so pretty. You’re right about the rain. It is overrated all the way around. Wow, what an amazing experience! I just graduated from college last May and have been dying to travel. Do you have any advice? I find myself thinking that it’s impossible for a girl of 23 with very little income to just pack up and go. Excellent post! I love the photos as well – very retro. I’m hopefully going to Belfast and Enniskillen this Easter for a few days. Can’t wait! The day you posted this is the same day I found out I’ve been accepted to study abroad in NUI Maynooth! My friend sent it to me because she saw it on the front page. Great post, and great photos! Reading this made me long for a visit to Ireland again, it’s been to long since last time I went shopping in Dublin and relaxing in Temple Bar District…. 🙂 Thanks! I absolutely loved reading a New Yorkan’s point of view on Ireland. Happy St.Patrick’s day! I spent only 10 wonderful days in Ireland but they live forever in my memory. My dream has always been to return and rent a cottage to use as a base from which to travel. Thanks for this blog entry. Brings back memories! love the pics and good for you! Great post! I, too, dug through my photo files from Ireland for yesterday’s post… Hard to pick just a few! I thought everything in Ireland was photo-worthy! I love that Newgrange triple spiral… I had it tattooed on my hip, in fact! A great blog and hopefully it will inspire some of your readers to hope on a plane and visit us! Great post! I used to live in Limerick, and find that I miss life there so much more around this time of year! Yes I’ve been and I loved it. Great photos! I’ve never been able to afford a trip to any foreign country except Mexico (I walked from El Paso to Juarez in 1987). But I’ve always wanted to visit Ireland–it’s my ancestral home, on my father’s side. These pictures are beautiful! Thank you for sharing them, along wwith your experience in Ireland, with us! I had a two day layover in shannon a couple years back and ive always wanted to go back.its a beautiful country with rich culture. Well the blog is great and I’m from Ireland, it doesn’t always be raining but we put up with it, fab photos glad you enjoyed it. Nice photos of your trip. Ireland is on my bucket list and after viewing your photos (and reading about the Guinness), the priority of that trip has been ranked higher. Great post and great pics. There is a comical amount of rocks, isn’t there? Heading to Ireland in June for 10 days and can’t wait! We will be arriving in Dublin and traveling south and west finally leaving from Shannon! Any tips or suggestions? Your photo looks like the Cliffs of Moher. I went alone in 1988 after my first marriage ended and have iconic memories of it.That trip reminded me of how much more myself I was when I was alone. I’ll go back with my grown daughter in the next few years. Your love of the place really comes through here. Thanks! I loved this post. I was in Ireland two years ago and it truly is a lovely place. Living and traveling in Ireland for a few months after graduation sounds like a great idea. I’m graduating from college in May and am hoping to get some traveling in again. I’d never think to go to the beach in Ireland! Love it! You did such a good job with descriptions and pictures! My daughter has been wanting to go after she graduates. Makes me want to send her so she can see some of the beautiful things you’ve seen and experienced. Because there was much there beyond any words I have. Something in the heart or spirit I had forgotten perhaps, or maybe misplaced. Yeah it all sounds very WGBH; but there was a genuineness in so much of the music we saw performed that reminded me of, or somehow I remembered. I remembered how much I like Rashaan Roland Kirk. Maybe it is the compassion in his music that matches the passion for it there, or maybe just a conversation we had in the van as we drove. I don’t know. But that combination of raw beauty, rage and heartbreak when he plays three saxophones at once; in on breath playing “The Inflated Tear” and shouting “Help him! Help him!” at the end, it kills me…But I digress. Music is really important to people there. People listen. We walked into the session at McGrory’s and there were people, people of all ages sitting around playing music. It was kind of shocking. They hate the song “The Galway Girl” in Galway and in Wexford “Fisherman’s Blues” doesn’t have much of a following. Actually Joe Henry, who is about 65 years old lent us his Gremlin; told us hilarious bad jokes and played harmonica beautifully on this song he made his daughter Lorna sing (It was the Rattling Bog I think). Never been, but these pics make me wanna go there! Nice post! I also lived in Galway for a while. Great place! Great craic! Also, it’s the prefect “hub” for going to places like the cliffs of Moher and the Aran Islands! Well done to you for going so close to the edge of the Cliffs. I could never do it! Loved your post even if it did make me rather lonely for home. wow! I always wanted to go to Ireland and this pictures make me want to go there even more! Love the soft exposure on your pictures. Thanks for posting. Great photos! I have never been to Ireland before, but I really want to go there. Your story just inspired me to go as soon as I can! My husband and I spent a week in Ireland in a rented home and spent a week living like locals for our honeymoon. We stayed in Kenmare and it was hands down one of the best experiences of my life (for lots of reasons.) At least once a week we talk about it ( and it has been 4 years) and we fully intend to retire there, at least part time. Thank you for sharing your memories. Nice way of looking back on old memories! havent been there ever. but reading the post makes me somewhat familiar to the place. was surprised to read abt the sunny days and also the numerous road signs which can also induce dizziness in me i think. great post! Oh my god! Ireland is my dream destination. Thank you so much for this virtual tour. You have some lovely shots of Ireland here with some great writing. I live in Galway currently and its nice to see some shots from the past, though little has obviously changed from the shots that you’ve posted. Take a look at my daily photo blog from Galway at http://www.feargalnorton.com and maybe you’ll recognise some sights. Cheers. Wow! Ireland was in my list of places to visit until recently when I have change my mind and removed it from my list. Now you are making me think about it again. Thanks for sharing some brilliant picture but I would also like to say that most of your picture are lacking brightness for some reason. If I ever go to Ireland I will definitely come here again and let you know. Thanks for the inspiration. Beautiful pics and fun-to-read post. But did you get to kiss the Blarney stone? Anyway, congrats on being FP. So many wonderful things I’ve never even seen, despite being Irish! This post made me a little nostalgic, as I haven’t properly been home in months. 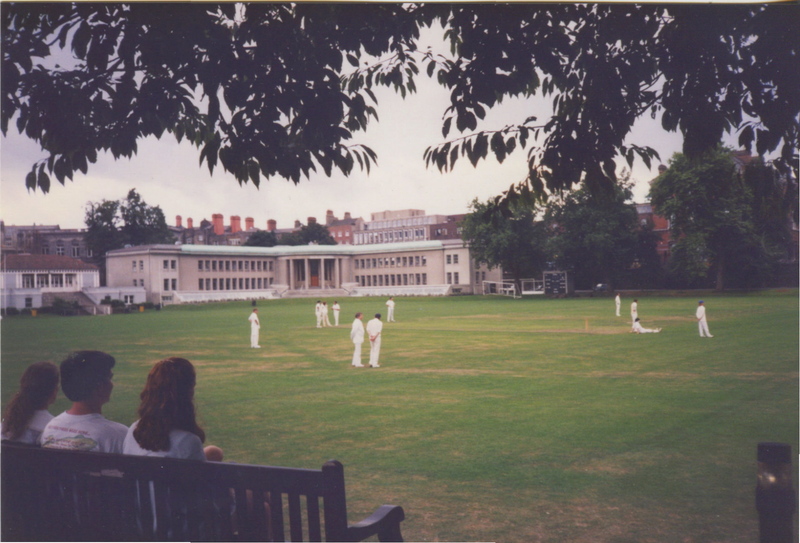 I did my Undergrad at Trinity College, and those same men playing cricket are probably still there to this day. ❤ Ireland. Nice pictures ! Iv’e never been to Ireland, but after reading this post I’m surely going to put Ireland in my list of the next countries I want to visit ! Thanks for sharing your beatiful experience ! Awesome photos from your trip. I want to go to Ireland so bad, but can’t get it planned yet. Hopefully someday soon! Great post! My husband and I went there a few years back for our anniversary. Loved it. Flew into Galway, hung out there for a few days and went to Connemara (including Kylemore Abbey of course), then drove down and spent time in the Dingle Peninsula – AWESOME. (En route checked out the Burren and Cliffs of Moher). Then on to Kinsale and Kilkenny for a few days, and flew out of Dublin. Loved all the stone structures in Ireland, the hiking, the trad music… and you’re absolutely right… Guinness IS better closer to the source!! Beautiful photos! 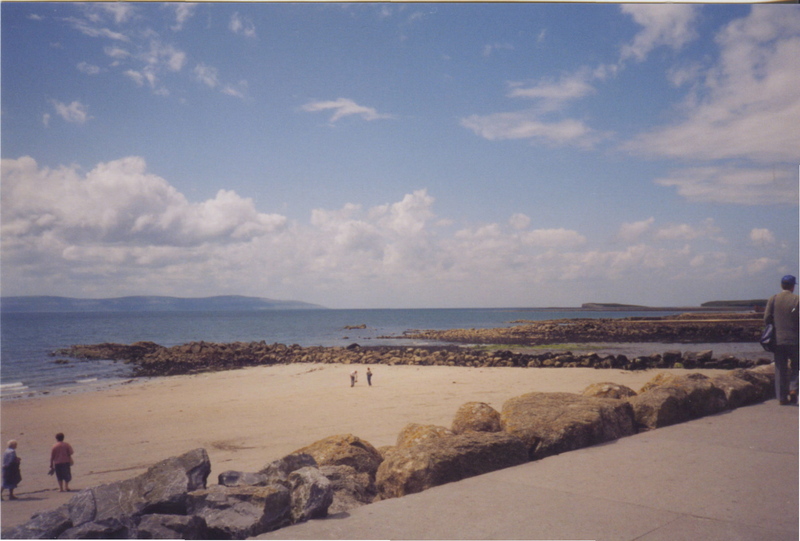 I spent a semester studying abroad in Galway–loved every minute of it! I, too, was surprised at how sunny it actually was in Ireland. Have you been back to visit since your initial trip? loved your post about Ireland. I lived there for 6 months between Oct 2001 and March 2002 and absolutely loved it. Went back for another few months in April 2002 till July 2002. What an amazing country. I too visited Connamara and the Aran Islands, visited the Cliffs of Moher where I defied gravity and hung over the edge (heehee), kissed the Blarney Stone and walked for miles along numerous rivers and clambered through a multitude of castles and monasteries. We travelled extensively from east to west, south to north and back again….amazing country, wonderful people. The only thing I can disagree with….Guiness; can’t stand the smell or the taste…urgh! The most marvellous and amazing country and truly the emerald isle. I have been back 8 times since…and now you’ve made me want to go back again!! 🙂 Thanks!! I love your photos of Ireland! I’ve been twice, once on business near Shannon and more recently I attended the wedding of a former au pair and brought my whole family with me. We started in Dublin, then up to Belfast, around the Anterim coast, to Derry, then Galway, then Lusty Beg for the wedding. I would love to have a little flat in Dublin and live in Ireland for part of the year. A THOUSAND THANK YOUs to everyone for your thoughtful comments and kind words! I loved hearing everyone else’s experiences in Ireland. The response to this piece from around the world has been absolutely thrilling…in fact, I did have an amazing St. Paddy’s, mostly because of all the support coming from YOU. Much appreciated. Truly. The second time was when I did a cycle tour trip in Northern Ireland from Larne to Londonderry and back. (in two weeks, by bike) It was an amazing trip. I have been as a child though my sole memory is of Blarney Castle and kissing the Blarney Stone. We spent that summer over thirty years ago travelling by car and sleeping in a tent across much of Western Europe. I had an opportunity to go back to Europe about ten years ago, but only London and a couple other places in England. I’d love to go back again to Ireland, but that’s probably not on the near horizon. Great post and very nice pics. My husband and went on a ‘world tour’ of Ireland when he was working for a local radio station here in Phx. We had such an amazing time, and met so many wonderful people. We have not traveled much and talked about seeing other places and countried before we re-visited a place we’ve been already, but Ireland is an exception. We would re-visit it in a heartbeat! I’ve never seen such beauty. The Cliffs of Moher … speechless! I have never been to Ireland, but I’ve seen lots of pictures of this wonderful country and someday I would like to visit its cities and villages. I’m Spanish and the nearest I’ve been to Ireland is England. I stayed in london for three weeks and visited also Oxford,Windsor and Eton. Actually, you can read about my experience in Windsor if you want to =) Nice post. Regards from the Sunny Spain. I have a couple questions about Guinness in Ireland. My American relatives visited Ireland last year and said two things about beer: 1) It’s very expensive, at least in pubs; and 2) it has low alcohol content. Always wanted to do Ireland – one of the places that is highest on my list but have not yet had the opportunity to make it so. As for cliff edges in Australia, they don’t have fences (do you really have them in America?) but I’m usually too afraid to go so far to the edge. Others are more daring. Nice picture of the view from the edge. Also, nice picture of you in the shorts. You look like you’re dressed for the 80s, to me. But, how would I know? I was only born on the tail end of the decade. And finally, as for the view, it certainly is, both in the first and last photo of the blog post. No, I haven’t been there, although I have been to Hawaii, and I got some great photos from the air as we came to land. My daughter did the same thing the summer before she graduated. She and two friends lived in Galway also. It was great because it gave me an excuse to visit Ireland. I probably would have never gotten my husband out of the States if it wasn’t for our daughter. The country is beautiful and your pictures brought back great memories. Thanks for sharing. Did you know I studied abroad in Galway in college? Yet another thing we have in common! After great trepidation and against the wishes of my family, I travelled solo to Ireland (Belfast and Dublin) for five days in total. Oh, how I regret that I was not there much, much longer. After travelling through Europe, I was starved of humour and just talking with strangers. The Irish are one of the most friendly and humorous of people and their wonderful accent is music to the ears. The country itself is stunning and I would go back again. Loved it! Good luck and thanks for your story and amazing photos. The triple spiral reminds me of the movie “The Seeker”. Now I know what it means! I definitely want to go to Ireland sometimes, seeing as I am 50% Irish! Never been, but traveled there through your photos. The difference between seeing photos of a place when researching it online and reading a blog with personal photos is that…, you feel the place through the experience of a real individual. Somehow, if only for a moment, their photos and stories transport you there and you even think to yourself “i can’t wait to go back”. Because momentarily, you were there.